LAKE BUENA VISTA – The sun shone brilliantly late Monday morning on Dave Martinez as he made his pregame rounds at Disney's Champion Stadium. 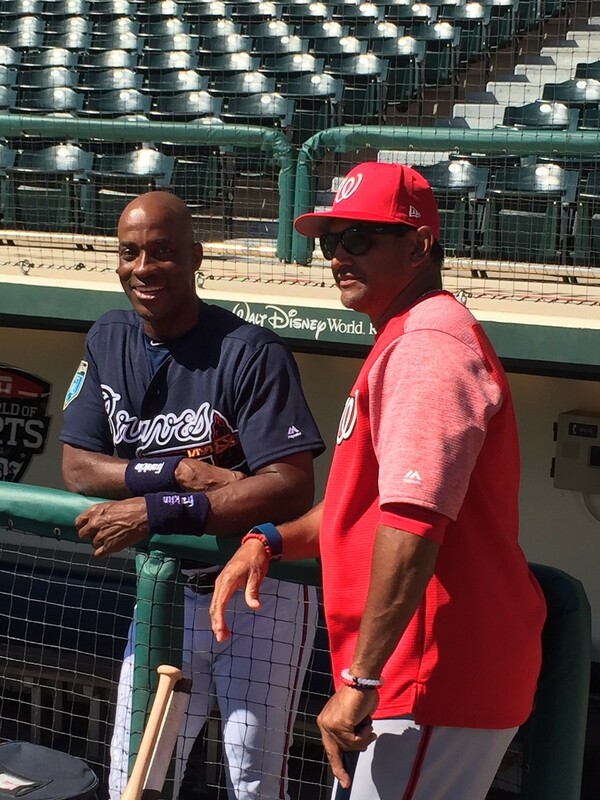 Martinez said hello to the Braves' spring training instructor, Fred McGriff, his old teammate with the Devil Rays. He hugged newly elected Hall of Famer Chipper Jones, an old teammate from Martinez's lone season with the Braves. Then, bat in hand, he jogged off to rightfield to mingle with the Nationals players who made the 2 1/2-hour bus ride from their spring training digs in West Palm Beach. After serving as the bench coach for the Rays and Cubs during the last 10 seasons, Martinez, 53, no longer operates in the shadow of Cubs manager Joe Maddon. The Nationals are his team. "I inherited a pretty good bunch of guys, a really good team," Martinez said. "I'm excited about." Dusty Baker was fired last fall after leading the Nationals to a pair of division titles, followed by consecutive losses in the division series. The Nats hired Martinez, a veteran of 17 major league seasons plus 10 more as a bench coach but zero years as a manager on any level, to pilot a star-studded roster. "We have that to overcome," Nats general manager Mike Rizzo said. "But I think with his baseball acumen, being at the right hand of Joe for so many years, managing games in his own mind, Joe said he co-managed very often, his having never managed in the big leagues is different from others who have never managed in the big leagues. We feel he is ultra-prepared to do it." Maddon said Martinez's best attribute as a bench coach was that he could have that difficult conversation with a player, be it a superstar or the 25th man on the roster. "He's not worried about hurting somebody's feelings or saying the wrong thing," Maddon said. "He's just attempting to do the right thing, to build trust with honest dialogue. And he's done that very well." Martinez was passed over several times for managerial jobs, including once by the Nationals. He said he never worried if he would get a shot. He worried about being the best coach he could be. "Did I want one? Yes. Did I worry about it? No," Martinez said. "I said if it happens, it happens. If it doesn't, I love coaching." Martinez, an original Devil Ray and long-time Tampa resident, will take what he learned from his 10 years with Maddon. He will also incorporate what he learned from playing for such managers as Bobby Cox, Lou Piniella, Don Zimmer, Jim Fregosi, Don Baylor, Johnny Oates and, yes, Baker. "I feel like I learned the game of baseball the right way," Martinez said. "Joe helped me learn the other side of the game, as well. I've been blessed, not that I wanted to play for that many teams, but I've been blessed to play for that many good managers and to learn from them." He is surrounded by an experienced coaching staff. Bench coach Chip Hale managed the Diamondbacks for two seasons. During his first meeting with the full squad, Martinez told his team he is here to help them succeed. He does not have to instill a winning culture. It already exists. He has to find a way for the Nats to win in October. "I'm here to get it right," Martinez, who has been to the playoffs in seven of the last 10 seasons, told his players. "He checks off a lot of boxes as a prerequisite to be a successful manager," Rizzo said, "and I think he's going to be a guy who will do really well for us."